Richthofen's first posting as a pilot of single-seaters was to the Eastern Front. There, the German ace Oswald Boelcke—the first German pilot (along with fellow ace Max Immelmann) to receive the Orden Pour le Mérite, Germany's premier award for bravery—chose Richthofen and another young pilot, Erwin Böhme, to join his new fighter unit. Less than three months later, while chasing a British fighter, Boelcke's and Böhme's planes collided. Böhme landed safely, but Boelcke's plane lost a wing and, as Richthofen later described it, he "rushed into the abyss." 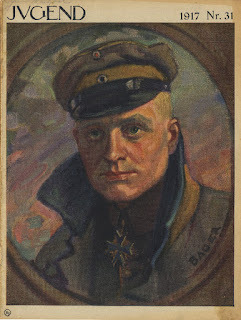 At his death, Boelcke had 40 victories to his name. Here, the green Richthofen describes first meeting the great Boelcke. The Champagne battle was raging. The French flying men were coming to the fore. We were to be combined in a Fighting Squadron and took the train on the 1st of October, 1915. In the dining car, at the table next to me, was sitting a young and insignificant-looking lieutenant. There was no reason to take any note of him except for the fact that he was the only man who had succeeded in shooting down a hostile flying-man, not once but four times. His name had been mentioned in the dispatches. I thought a great deal of him because of his experience. Although I had taken the greatest trouble, I had not brought an enemy down up to that time. At least I had not been credited with a success. I would have liked so much to find out how Lieutenant Boelcke managed his business. So I asked him: "Tell me, how do you manage it?" He seemed very amused and laughed, although I had asked him quite seriously. Then he replied: "Well, it is quite simple. I fly close to my man, aim well, and then of course he falls down." I shook my head and told him that I did the same thing but my opponents unfortunately did not come down. The difference between him and I was that he flew a Fokker and I my big fighting machine. I took great trouble to get more closely acquainted with that nice, modest fellow whom I badly wanted to teach me his business. We often played cards together, went for walks, and I asked him questions. At last I formed a resolution that I also would learn to fly a Fokker. Perhaps then my chances would improve. My whole aim and ambition became now concentrated upon learning how to manipulate the stick myself. Hitherto I had been nothing but an observer. Happily I soon found an opportunity to learn piloting on an old machine in the Champagne. I threw myself into the work with body and soul, and after 25 training flights I stood before the examination in flying alone. Wasn't the Blue Max an award for meeting a criterion of downing a specified number of the enemy, rather than an award for valor in battle? I guess "bravery" can be inferred from the fact that they faced the enemy enough to get their qualifying kills for the award.